Hello! Thank you for visiting my shop. <3 Please know that this item was handmade by me on my sewing machine (not in a factory!). This Unicorns pouch is the last one that will ever be made. 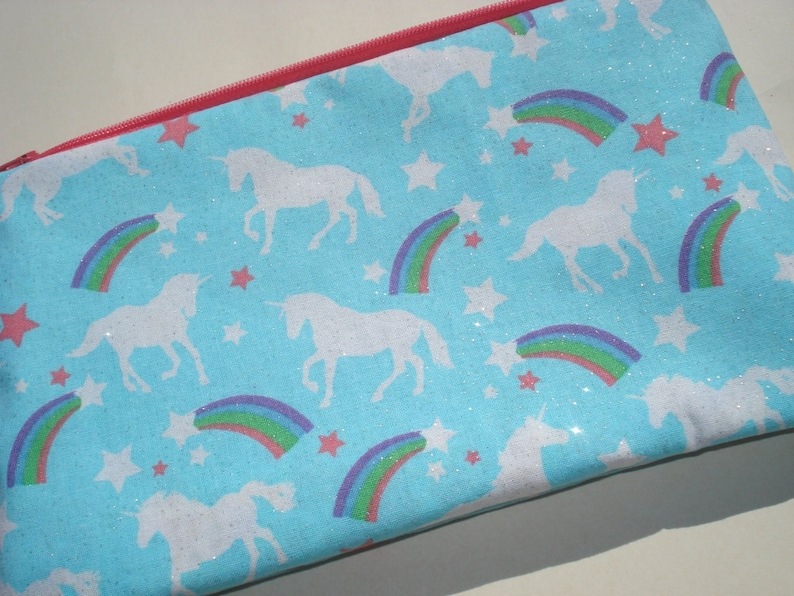 This zipper pouch was made using blue fabric featuring white unicorns, rainbows, stars, and sparkly glitter (this is NOT the kind of glitter that will fall off and be everywhere, so no need to worry about that). I gave the pouch a pink zipper and a solid purple lining. Love the owls. Well made, great pattern. SALE Large Owls Zipper Pouch: Flowers, Stars. Sushi Bar Zipper Pouch - Japanese Food, Hibachi Bar. Sock Monkeys Zipper Pouch: Pop Art, Cartoons.